On Marajó Island, Pará, Sr. Rita Raboin works with the diocesan Justice and Peace Commission, the Land Pastoral and in community organizing. Due to a precarious system of water delivery and waste control, Marajó’s unhealthy water supply has become a critical issue. 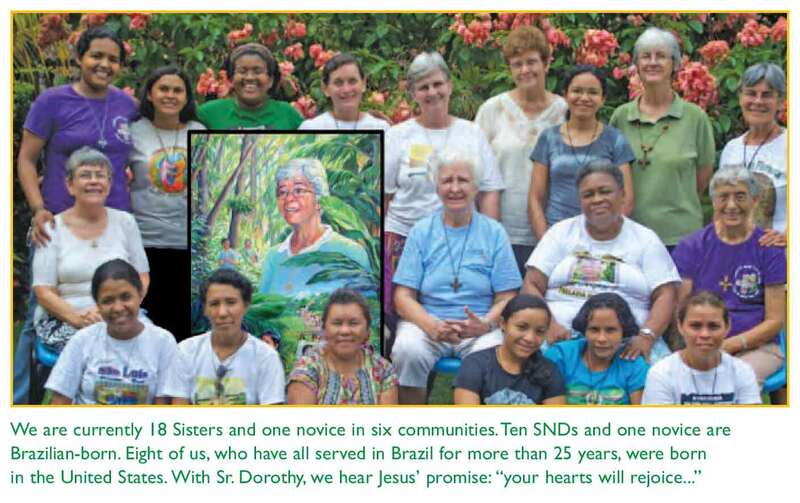 Sr. Maria Socorro de Oliveira, returning from English study in Ohio, USA, will soon begin a new ministry among the people in Breves. We and the youth with whom we work are providing an island of hope in Jardim Tropical. A group of 30 to 40 young people that I (Sister Maria) facilitate are active in a weekly youth group. These youth help prepare the liturgy and also participate in novenas, processions, preparation for baptism, a nutrition program for babies, and protest marches – all activities that energize our community. The youth named their group “Planters of Peace,” a significant choice in light of their neighborhood situation. 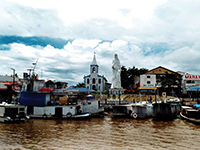 Our Notre Dame community lives on the island of Marajó, on the largest navigable archipelago in the world, located at the mouth of the amazon river, in the State of Pará, Brazil. This is an island of beauty and challenge! The people find their means of support in extraction of açai for juice, palm hearts, wood from family-owned sawmills, and fishing. Some plant and sell cassava, rice, or beans. In our county, there is 80% unemployment, gang violence, drug trafficking, and other criminal activity. Unable to find jobs, the people are migrating from the river communities and searching for schools for their children. Our neighborhood with 4000 persons and 853 families, on the periphery of Breves, does not have any school, health clinic nor potable water. Our streets are muddy in the rainy season and dusty in the dry season. Most women work in homes of wealthy families; the men find odd jobs daily. On days when adults do not work, the families do not eat…. Read the full story in GoodWorksJune2011 on pages 8-9.